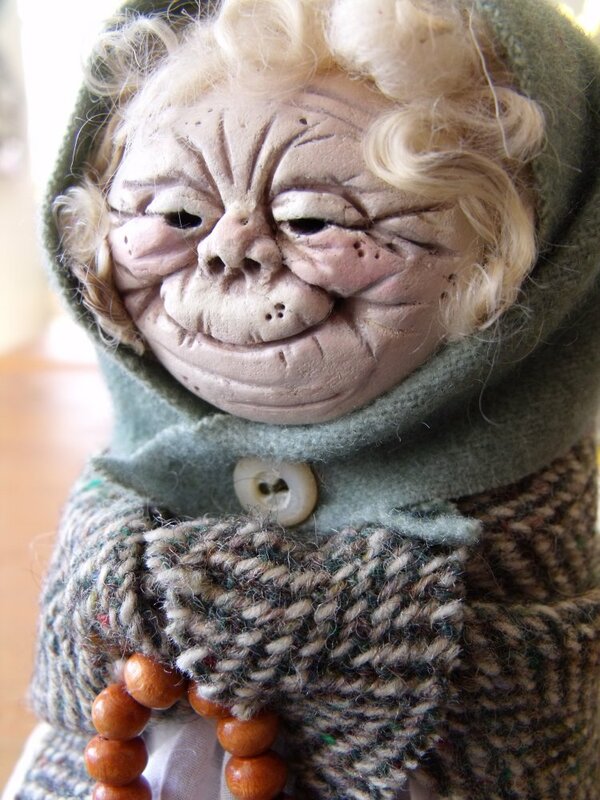 A faery find., originally uploaded by woodlandfaerie. I ran across this photo on tumblr.com recently, and it stopped me in my tracks. I haven't been that excited by mixed media collage lately, I've mostly been sewing and seeing what others are sewing, and not really looking at collage very much. All of my ephemera is at the studio, and all of my sewing things are at home, so that probably has a lot to do with it...when was the last time I got to go to the studio??? This is just lovely. 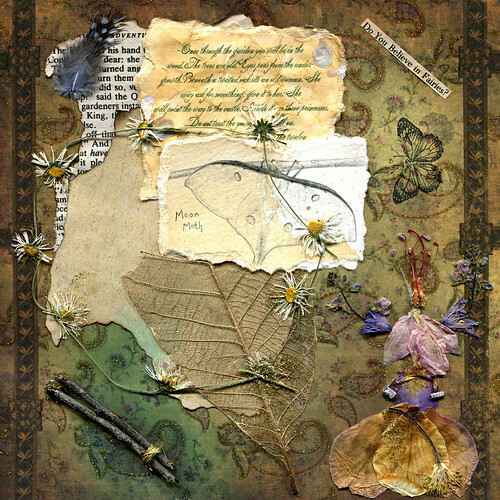 I love the pressed flower fairy, and how none of it feels contrived to me, just so sweet. I miss you, collage! Don't be a stranger. 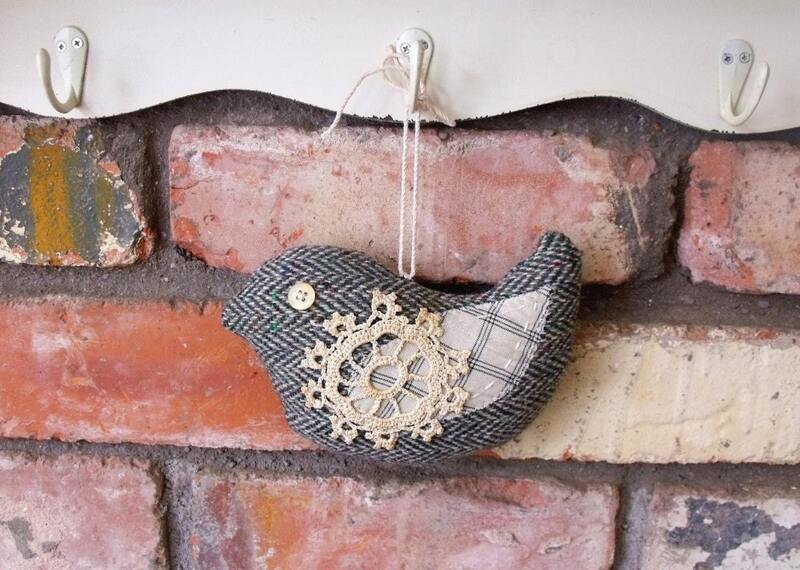 I made some little birds last week, just made them up as I went along. I can't just make one of anything, have to make two, or three, or five. Fun little project! Traced the shape on to a piece of card to make a template, and then went crazy making birds! Find these and more in my Etsy shop. 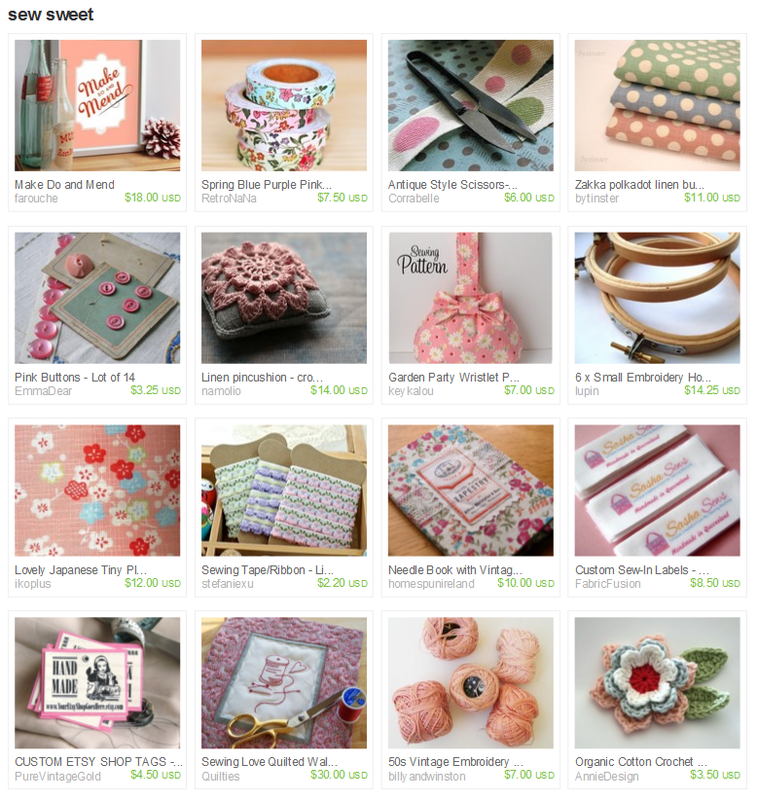 Just spent an hour browsing beautiful sewing supplies on Etsy! Everything so gorgeous I could gobble it all up. 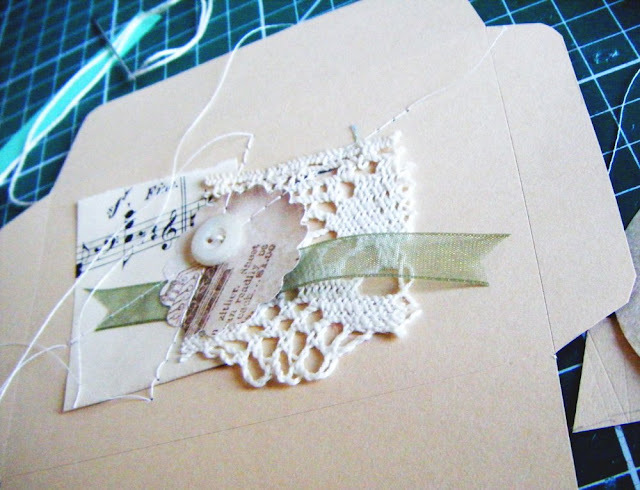 I love treasuries...I'm not just looking at pictures, I'm MAKING something! Haha. Visit the treasury and click on the items here. I haven't made dollies in years. 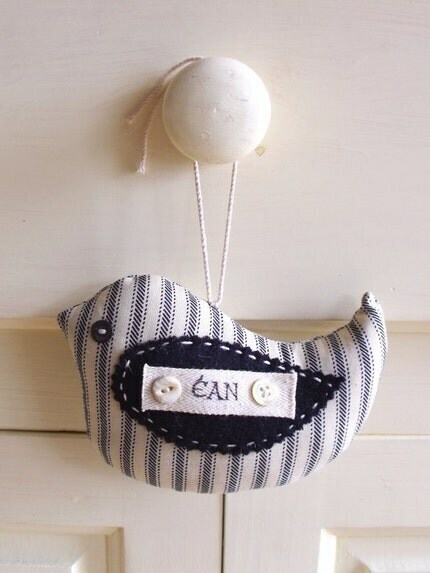 I used to make them regularly, and sell them on Ebay...I enjoyed making them but they were incredibly time consuming. They had long arms and legs, and I made their bodies myself, stuffing them and painting the muslin and sanding it, and then making their dresses, complete with sleeves and an apron. I adored them, but once I opened the shop, I just didn't have time anymore. Over the past few months I've had a compulsion to make them again, I still have lots of paperclay and wool for hair, everything I could need. But I still am always caught for time and didn't see how I could make it happen. 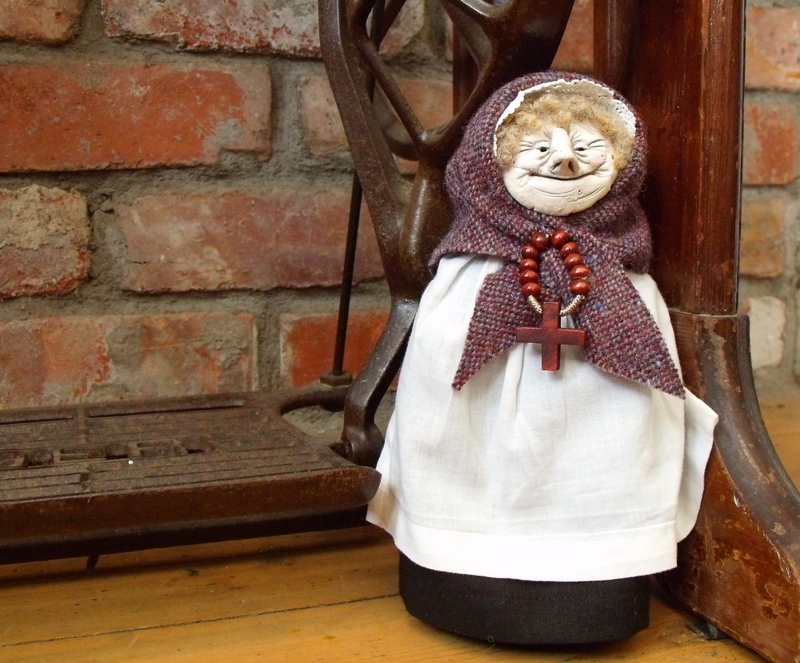 But I had a brainwave after seeing the proliferation of matryoshka dolls on Etsy...sure, weren't the shawlies I make just Irish babushkas? 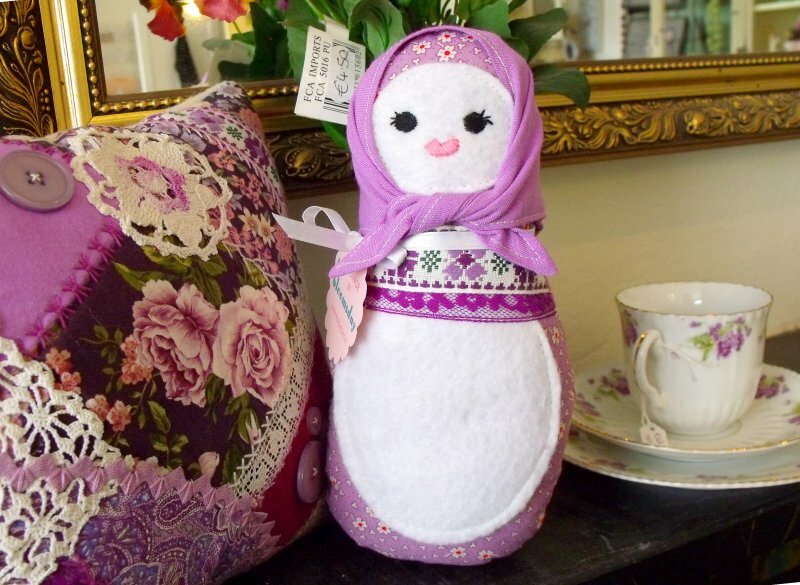 And couldn't I make dolls like the matryoshkas, and cut out the process of making the long arms and legs, which were half the work? So I got out some clay and started sculpting, actually intending to make more stylised faces than I used to...but out of the clay peered the little face, and it was the same shawlies back. It was as if they were saying 'hello! there you are!'. The little wrinkled smiling faces were just the same girls as always. So I made their little bodies and their dresses and their aprons, and even though it was easier not making the arms and legs, the process was the same, the same needle-felted hair and wool shawls, and they hold all the same magic for me, the same little people in the room with me. I missed them! I can't wait to see who else turns up. Both of these dolls, Mrs. Dineen up above, and Mrs. Motherway (named for the corner shop in our village! 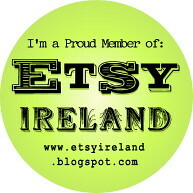 ), are listed on Etsy, if you'd like to see more! We did the flowers for a stunning wedding over the weekend, the most creative wedding I've ever done! The bride has the same aesthetic as we do at Bloomsday, so it was a perfect match. 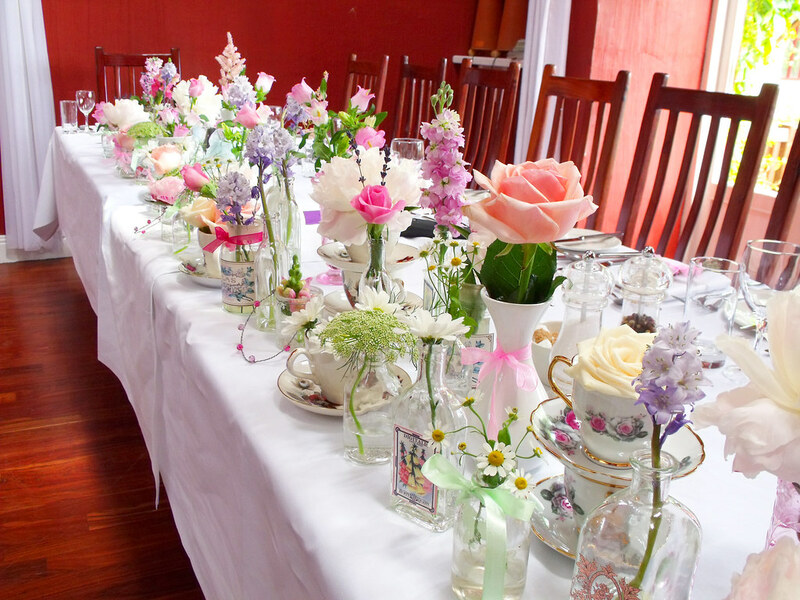 Pretty, vintagey, summery...just gorgeous! If you like to look at flowers, check out our Flickr! I've been working on something different for the past week or two, some toys to sell in the flower shop. I decided this year to start stocking the shop with antiques and handmade, rather than buying in "antiques" and "handmade" from China. It's a lot more work! But it costs less in the long run, and we have unique items! These are not anything like I would normally make but they fit in around here. I made ten of these toys, some babushka ladies, bunnies, a bear, a monkey, a puppy looking thing, and a kitty. They were fun to make! I kind of made them up out of my head after looking around at a lot of these kind of plushies online. I am especially proud of my handmade hang tags. 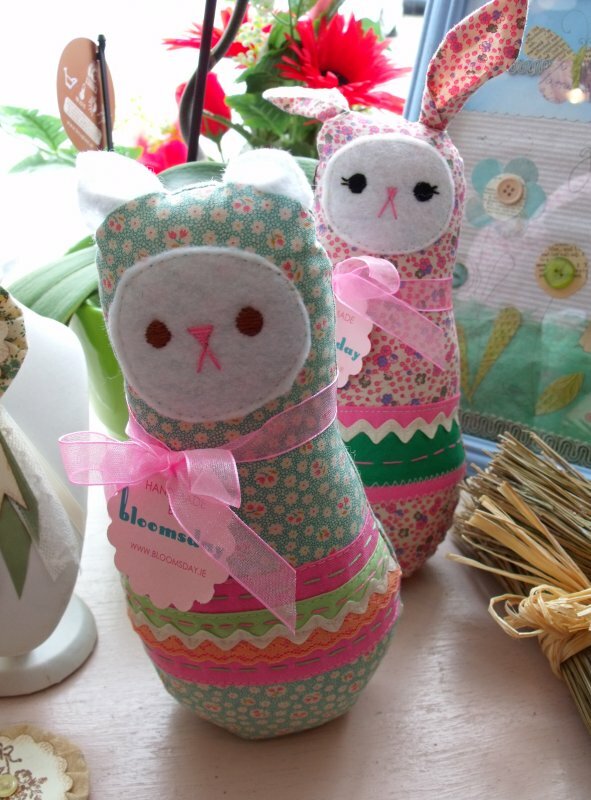 I don't know if anyone will buy them but they look adorable in the shop! 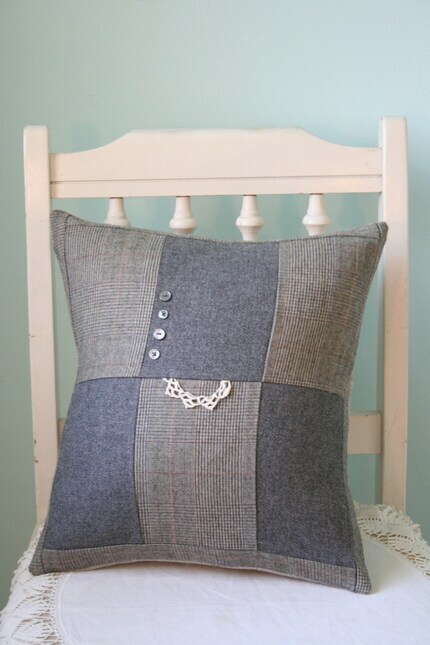 I just made the most adorable treasury over on Etsy! Henry, as we know, is obsessed with tractors, and so I have them on the brain. I was browsing Etsy's catagories searching for 'tractor'...found so many interesting items! Good fun, I particularly love the farmer painting on an old LP, and the vintage photo of the farm wife with sheep dog. 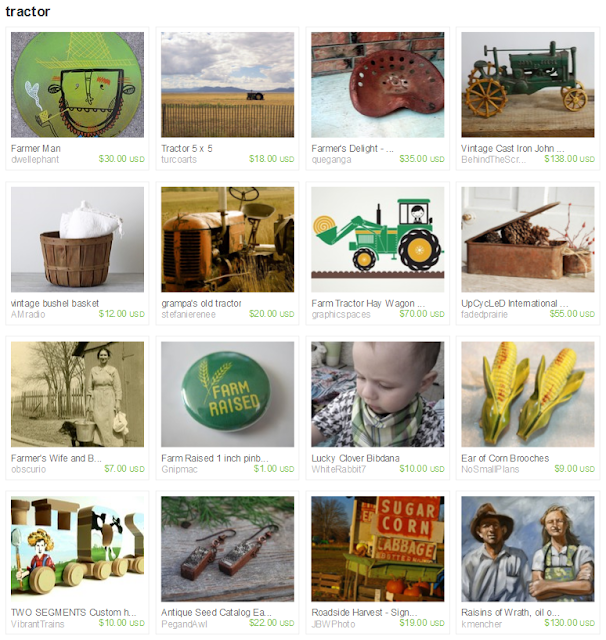 Click here to visit the treasury page, and please leave a comment there! 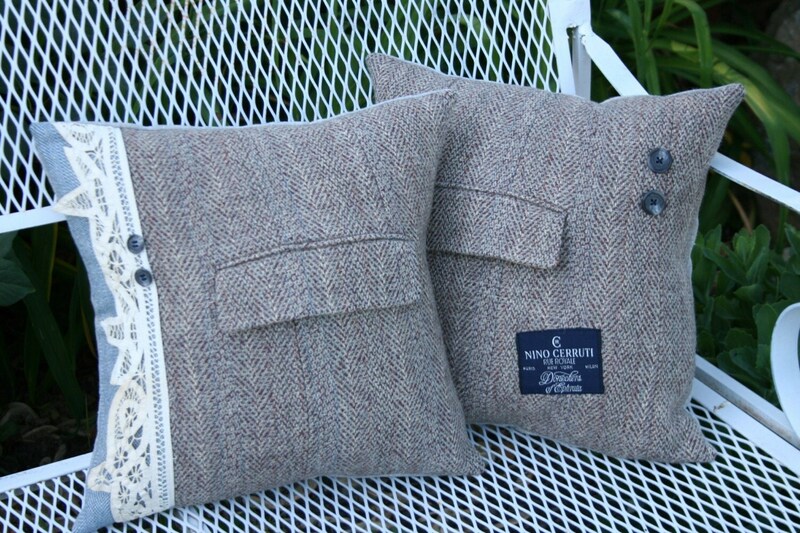 I love wool and lace together, it's a classic Irish combination, the two great Irish textiles (linen, you're a close third). When I see wool and lace together it just speaks out loud to me. Emma Dear has hundreds and hundreds of things that keep speaking to me, taunting me. This recession can end any day now, seriously. When I listed my scapulars on Etsy, I put in the description that it would arrive in a decorative envelope. Of course I didn't make any decorative envelopes, sure I could throw something together on the day, right? Guaranteeing that I would get three orders in one day...oh dear. I had some of those little church donation envelopes (sorry, church), and I played around with them but because they were already an envelope, I couldn't really embellish it very much. So instead I flattened one out and traced the shape on to some coloured paper, and scored along the folds. 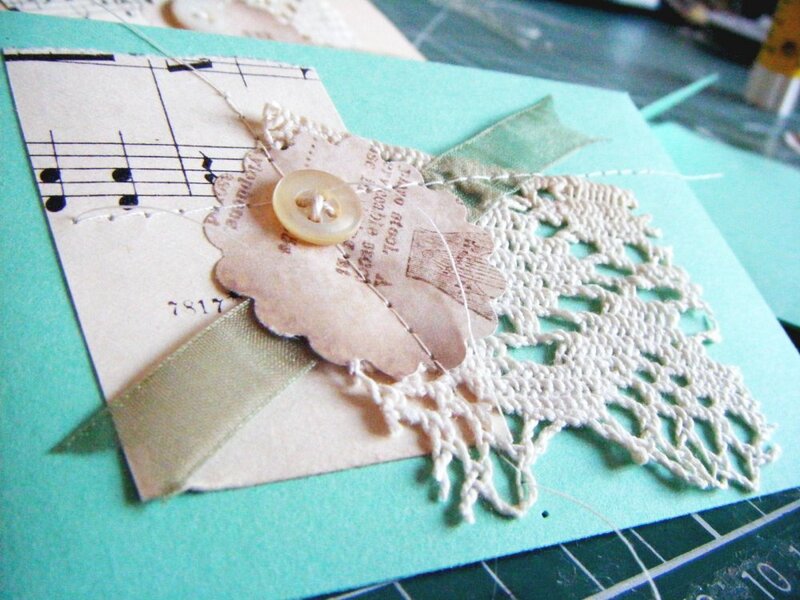 The flat envelope could then be embellished and run through the sewing machine for some impromptu mini collages, resulting in sweet little decorative envies! A bit of glue stick and I was away. The true skill and workmanship is that I made these in the hour running up to a two-year-old's bedtime as he desperately tried to get my attention, the poor pet...my craft room is destroyed with bits of paper from distracting him with paper punches and decorative (thus blunt) scissors. If only I'd had a little girl, I imagine she would quietly play in my ribbons and cloth dollies, but unfortunately until I start making tractors up there I'm going to break his little heart.